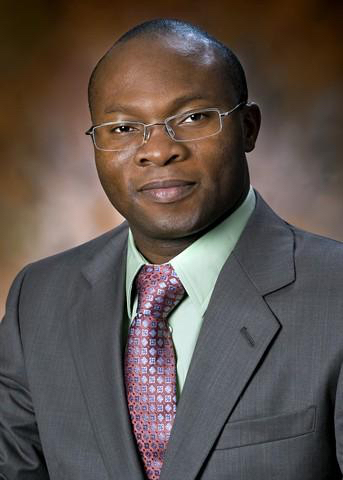 Jean-Luc Ayitou, assistant professor of chemistry, has won the Faculty Early Career Development (CAREER) Award from the National Science Foundation, Division of Chemistry: Chemical Structure, Dynamics and Mechanisms. The award, totaling $650,000 for five years, is for his research on novel polycyclic chromophores that exhibit anti-aromaticity. Anti-aromatic compounds are thought to be far less stable than their aromatic counterparts, but these molecular systems possess attractive photophysical properties that are highly sought in photonic materials science. Ayitou is proposing to devise new synthetic strategies to prepare these novel organic chromophores and their corresponding light-harvesting dyads, which can be employed for photon upconversion–an elegant and sustainable solar energy management approach that can help maximize the efficiency of current photovoltaic devices (PV) or solar cells that can absorb light and produce electricity. Ayitou and his team will use the tools of synthetic organic chemistry, computational modeling, advanced spectroscopy and X-ray diffraction crystallography to accomplish the proposed project, which presents a mosaic of scientific techniques. They hope to exploit the outstanding photophysical properties of the proposed organic light-harvesting systems to devise next-generation organic photonic materials. These novel materials can be further derivatized to engineer not only high-efficiency photovoltaic devices, but also materials for biological imaging among other applications. As part of this project, Ayitou has started an outreach program in an effort to promote diversity and a better understanding of socio-cultural relevance of the chemical sciences and other STEM disciplines. The program, VISCUS (Vivifying Scientific Curiosity for Underrepresented Undergraduate Students), will allow him to mentor and provide training for students who will participate in the proposed research. Additional educational components of the research include outreach activities that promote STEM education. at Illinois Tech and in the South Side communities of Chicago. The students involved in VISCUS are expected to serve as ambassadors for STEM research in their respective communities. The NSF CAREER Awards honor early career-development activities of teacher-scholars who most effectively integrate research and education within the context of the mission of their organization. Such activities should build a firm foundation for a lifetime of integrated contributions to research and education.